Director of Music sought for two neighboring liturgical congregations in Manchester, CT.
Concordia Lutheran (ELCA) and St. Mary’s Episcopal are seeking a person with experience in the liturgical traditions to direct worship and choral programs. This is a new joint position and it will be built around the particular skill set of the applicant. Applicants with only choral skills or both choral and keyboard skills are encouraged to inquire. Both churches have pipe organs (Austin at Concordia and Rodgers combination electronic and pipe at St. Mary’s.) and grand pianos. The joint choir from the two congregations would prepare anthems each month. ​The rector of St. Mary’s and the pastor of Concordia will meet with interested applicants to more fully describe the position prior to formal interviews. Compensation determined by education and experience and scope of position. Please provide a cover page with a one page CV/resume with any significant education, previous positions and experience. Music is a vital part of life and worship here at St. Mary's, and all parishioners are welcome to take part. Music touches our minds, opens our hearts and lifts our souls. It shapes the spirituality of those who hear it and those who prepare and present it. It can help lead us to God. 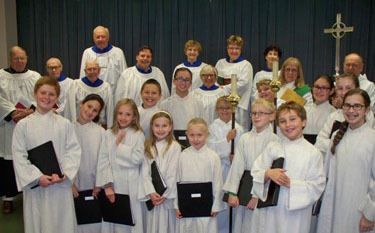 Music ministry at St. Mary's is carried out primarily by volunteers, supplemented periodically by gifted professionals. Senior Choir – The Senior Choir is open to adults and high school students who rehearse weekly and sing at the 9:00 a.m. service and other liturgical celebrations. Choir members also enjoy undertaking larger musical projects in collaboration with other church choirs and instruments. For those who cannot commit to a full year of choir, shorter commitments are often possible. Rehearsals are on Thursdays 7:00 to 8:30 p.m.
Bell Choir - The bell choir rings three octaves of English handbells during services periodically throughout the year. Ability to read music is helpful but not required. Rehearsals are on Tuesdays from 7:00 - 8:00 p.m.
Vocalists and Instrumentalists – Parishioners who have musical ability on an instrument or as vocal soloists are invited to share their talents in church as appropriate. Musical selections and rehearsal times are arranged on a case-by-case basis with the Minister of Music. 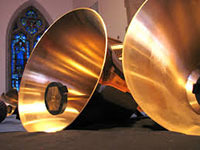 Richard J. McElraevy Memorial Concert Series – This concert series at St. Mary's is a made possible by the gift from the McElraevy family in memory of Richard J. McElraevy. Richard J. McElraevy was a mentally retarded gentleman who died in 1997 at the age of fifty-four. In spite of his limited abilities and his lack of conversational speech, Richard did have a special talent – he had a lovely singing voice and a wonderful memory for lyrics. He was happiest when listening to music or singing his favorite tunes. In 1999, his mother, Jean McElraevy, felt the most appropriate way to memorialize her son would be with a concert series that would unite all who gather with each other through the universal language of music. Jean, a parishioner of St. Mary’s, took great delight in attending all the concerts until failing health prevented her from doing so. Sadly, Jean McElraevy passed away on August 1, 2011, but her legacy will live on for years to come in the presentation of the Richard J. McElraevy Memorial Concert Series at St. Mary’s Church. The series presents two to three concerts each season in a wide variety of musical styles. All concerts are open to the public at no charge.